Our Laurel Wreath sticker design template makes it easy to put your school or special school event in the limelight. Use Laurel Wreath to promote school fundraisers, alumni events, college nights at high schools, and more. Laurel Wreath is available in five different color schemes, two shapes, and three distinct edge finishes. Laurel Wreath features a neutral, linen-look background with an academic wreath graphic in the middle. 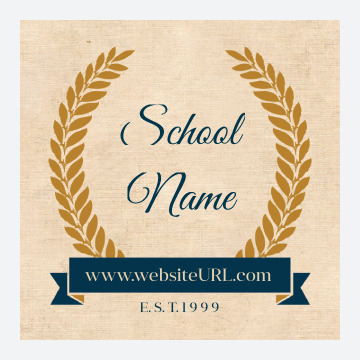 Inside the wreath is space for your school name written in elegant script with a solid colored banner displaying your school website URL. Below the banner is a space that reads “EST” and the year. Print custom stickers using our Laurel Wreath design template today! Our free sticker maker lets you create a custom sticker in minutes. Start by selecting your favorite professionally-designed template and a color scheme that fits our school or business. Next, personalize your text. The design tool walks you through the whole process! When you’re done designing, you can even get a free PDF to share with colleagues before you print your custom stickers. Our premium sticker paper, vibrant soy-based inks, and high-quality printing will ensure that your stickers get noticed. Plus, all our sticker projects are backed by our 100% customer satisfaction guarantee, so you can be confident choosing PsPrint as your sticker printing partner! Want your stickers to stand out with extra shine? We offer foil stamping services! Like the convenience of sheet stickers? We have them! We also carry window clings, vinyl stickers, bumper stickers, and more! Do you want need help? Our custom printing team is available to help you make your ideas a reality. Partnering with PsPrint for all your sticker printing needs is a smart decision! And don’t forget, we offer a full line of other print marketing products, too!